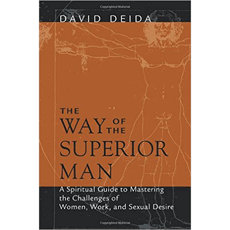 David Deida writes an amazing book and elegantly describes the correct behaviors for living a powerful life with woman. He describes the feminine attribute of testing a man to see if he is worthy to a high degree. This is one of the few books and he is one of the few teachers that really understands women to this degree. A must have and constant companion for all men. David often references spiritual concepts that may not make sense to the lay person, although this doesn't matter as it doesn't interfere with the understandings.